This is the third and concluding post comparing translations of Horace Odes. Theme: Death comes to all. scan sky you will die. Archytas, thou couldst measure; now, alas! O’er air’s wide realms; for though hadst yet to die. Here the longer lines have allowed Conington to make more of the verse, and the rendering is faithful to the original in content and tone, though now very dated in its diction. Visited with a mind that all the while was doomed to die. And Tantalus, who supped with gods. Again not one of Marsh’s best. The piece has been recast in a style that even then was rather old-fashioned, and various poeticisms added to give the rapture of inspiration to the lines: ‘meed of dust’, ‘not aught avails him now’, ‘airy citadels’, ‘doomed to die’, ‘supped with gods’. Today we’d probably think the poem would be stronger without such aids. The content is padded out but essentially faithful: even ‘meted with his wand’ could conceivably serve for mensorem. but profited little; for still you were mortal. David Mulroy is Professor of Classics at the University of Wisconsin-Milwaukee, where he has taught since 1973. He is the author of many translations from Greek and Latin, and of The War Against Grammar, a critical look at the neglect of grammar in contemporary education. 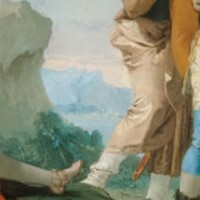 The Latin has been rounded out to make it more accessible, successfully, and, if the rendering is a little too reasonable, it astutely avoids the failures of other translations that aim to convey more of the poetry. you’re lightly buried near Matine. as ghost of the wind. The translator here is Alice Fulton, who has taught at the University of Michigan, Ann Arbour but is now at Cornell. She has published five books of poetry, and has received fellowships from the MacArthur and Guggenheim Foundations. The rendering is a recreation, but with only limited success: Tithonus as ghost of the wind is imaginative but not what Horace is really saying: Tithonus was winnowed to air, to nothing at all: it’s the emptiness of air and not its movement as wind that is being emphasized. There’s nothing in the original about snow, and nor would there be: it can be cold, wet and windy on the Matinian coast, but it doesn’t snow. Lightly in the remainder of the line is again off kilter: Horace is saying that, despite the immense learning of Archytas, he is buried in the meanest sort of way, i.e. there is none of the ‘earth lie lightly on my grave’ association of English Romantic poetry in the original. Indeed the whole translated line is misleading, seeming to echo a recipe: Achytas is first dusted with snow and then lightly buried. Those unwanted comic effects continue with dare castles in the air (the man was a philosopher, not a daydreamer) and double the cube (with echoes of the Rubik cube). The death-bent is a neat condensation, but picks up connotations of ‘hell-bent’, which destroys its effect. More important, the rendering does not convey the lapidary neatness of Horace, though the general meaning is rendered well enough. that you, born to die, have explored the celestial houses crossed, in spirit, the rounds of the sky. This piece is as previous renderings by Tony Kline, though not quite as faithful. Horace always needs some re-creation from his compact and not always obvious lines, but celestial houses may be too astrological a term and took off to the heavens is over-emphatic: Tithonus was not rocket-borne but simply wed Aurora. Otherwise, the rendering flows easily, maintains the correct tone, and should appeal to a contemporary audience. with a mind that was to die. and Tithonus, though carried off into the winds. The duly sprinkled is anticipating matters: oblations come later in the poem. ‘Boon companion’ is also an odd choice, but helps to give the lines their momentum and muffled thunder, though the previous comment on Tithonus still applies. The rendering is again prose but a powerful and attractive prose. along the monotonous Matinian coast. The First Archilochean has been conveyed by a rhymed 6 5 6 5 stanza, which is here a little too ample for the content, ever a problem with fixed stanza forms. Line 4 has therefore been padded out with ‘monotonous’, and the present tense ‘fare’ employed to meet the rhyme rather than the past tense that the English meaning (if not the Latin) more properly requires. Or to make this the last. Its strength with barricade of rocks. We talk Time, grudging, runs a mile. linden wreathes are not my style. might drink their fatal venom. not as a slave, and not as someone’s prize. to be humble woman in a proud triumph. a final darkness to her veins. as woman humbled but a queen. 2. Marsh, E. The Odes of Horace. Macmillan, 1941. 4. Mulroy, D. Horace’s Odes and Epodes. Translated with an Introduction and a Commentary. Michigan University Press, 1994. Google Books. 5. McClatchy, J.D. Horace The Odes: New Translations by Contemporary Poets. Princeton Univ. Press, 2002. 7. Knox. P.E. and McKeown, J.C. Oxford Anthology of Roman Literature. OUP, 2013. Google Books. 8. Holcombe, C.J. 2014 The Odes of Horace. Ocaso Press, 2014. Free ebook.